Weezer should totally write a pinball song. Pinball's nerdy right? It would fit perfectly with "In the Garage" - a place where many people keep their pins! -The person doing the pinball destruction is pure, unadulterated evil. I don't know where this unimaginable glut of pinball machines comes from! I'll take them off your hands for you, Hollywood! Sigh... I present to you No. 1 in my museum of pinball violence: Lasterblast. He lets loose his lasers! 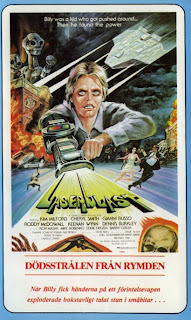 The machine is clearly outside in a parking lot, but in the next scene he's running out of a building, so I guess the machine was inside. Since he doesn't destroy anything else inside, he was clearly on a pinball assassination mission. 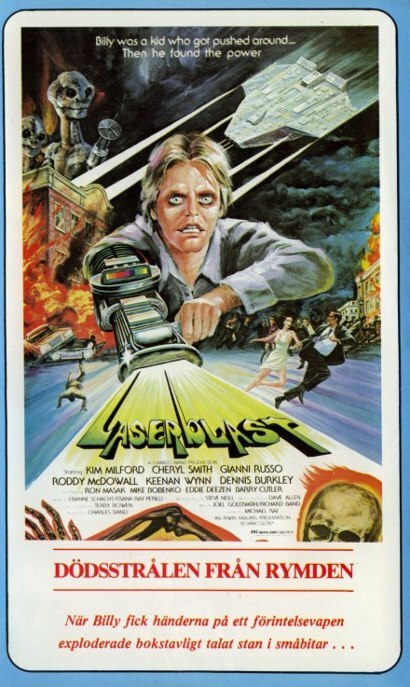 Maybe he was so frustrated that he couldn't put up a decent game with his ugly laser arm. You can watch the scene here (it's about 6:50 in.) What gets me the most is how sudden it is! There's also a scene where billy blows away a Star Wars billboard, which just leads me to believe that he is literally going after everything I love and hold dear! I could do this all day! Anybody out there have any good pinball theme combos? First off, let me just say that I am going to ignore the large sum of money I initially spent to buy the pinball machine. I knew I was never going to pay that off, and I was happy to pay it, to bring this machine into my life. In looking through all my receipts I was more interested in knowing if the machine was bringing in enough money to sustain all the tools and parts I had to buy, to fix up the machine. Okay, kids, it's MATH TIME! Well, I don't know about you, but I think $86 is a very reasonable price to pay for one year of a fun new hobby. I learned a lot about fixing up pinball machines and about electronics and circuit boards and all kinds of other things. 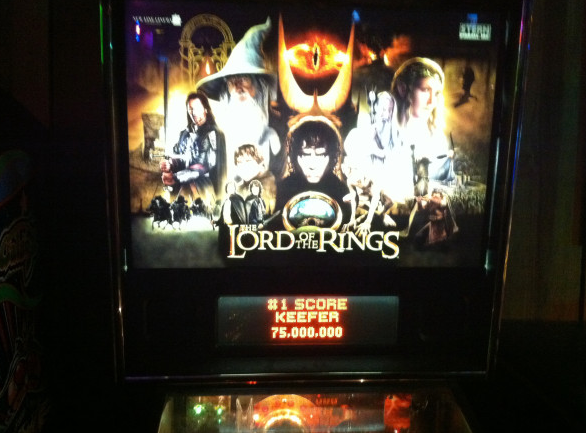 Plus I got to play a lot of pinball and share it with a bunch of other people. Again, I'm not counting the initial cost of the machine here (or other side stuff like pinball DVDs) but even with that stuff added in, it's been a total blast operating this machine, and I look forward to another year keeping it in the best shape I can! New DTZ Readers and Their Pin-blogs! Another cool aspect of our recent spike in Drop Target orders, is getting to know some of our new readers! I thought I'd share two of their sites with you all. First up is Tyler Hollback, who recently started the Pindiana blog, in which he will be documenting machines on location in the midwest. So if you live in that part of the country, check it out to find where some pins are located "in the wild." It also looks like Tyler will be talking about repairs on a few pins that he owns. Good stuff! Second, from Portland, Oregon, is Paul Nama, who has a small site where he has been documenting a few pinball machines that he has built himself! Above, you can see one of the coolest things he has done, which is to project the playfield art onto a blank playfield surface. This allows him to change the graphics at will, incorporate animation, etc. It's kind of like Pinball 2000 taken to the extreme! (Pinball 2011?) Anyway, check out the rest of his site to see his process. It's pretty cool stuff! Oh man, most of you pinballers probably already know about rec.games.pinball but just in case you DON'T, Jon and I can tell you how awesome it is. We are both still on a big "Repair Rampage" right now, fixing up our machines, and in the last week we have both used this valuable resource to help out with our endeavors. 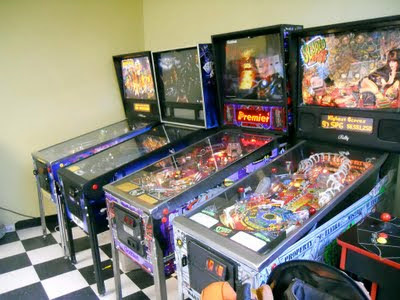 rec.games.pinball is a usenet group (which is like an online bulletin board system, which was developed at the end of the 1970s). This one is devoted to pinball, and there are a LOT of users on there! Jon and I have been using the Google Groups version of the group, and it is extremely easy to use. It's basically works the same way as Gmail, and is fully searchable, with entries going all the way back to 1990. It is a vast repository of pinball knowledge! Jon posted a question about getting a scan of some JP plastics and got a response within an hour. I posted about some mid-playfield G.I. problems that have been plaguing my machine for the past few months and got some expert advice almost instantaneously. It really seems like the main gathering place for the pinball community. As I said at the start, most of you probably already know this! But just in case you don't (as we didn't) I thought I'd put up this post. I've also added a link in the "PINBALL RESOURCES" sidebar of this blog for easy access in the future! FAQ: Subscriptions / The Future of Drop Target! It's been a busy week here at Drop Target Zine headquarters! Thanks to a link from the PAPA blog and a mention in Jim Schelberg's PinGame Journal email blast, we have been sending out a lot of zines to new readers. 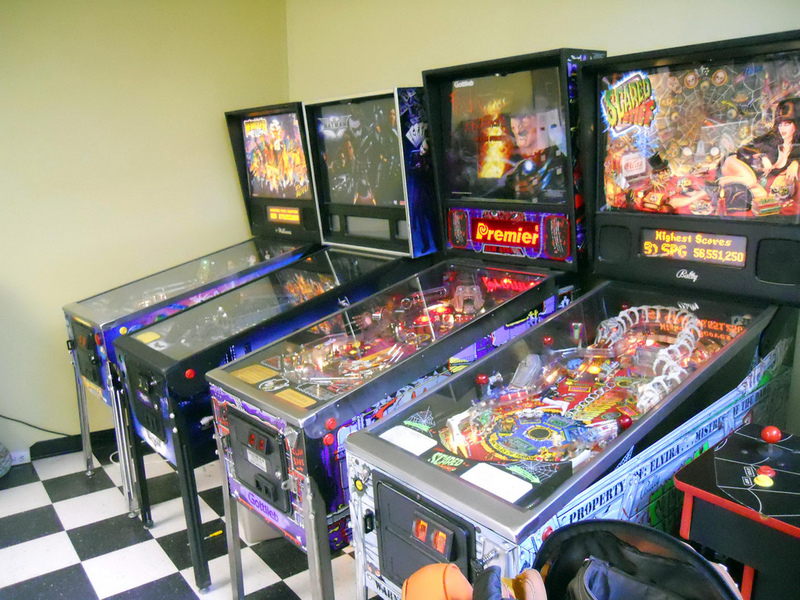 Thanks to both of these great pinball organizations and welcome to our new readers! One question we have been getting a lot is, "Do you guys offer subscriptions?" I thought I'd just answer that here on the blog so that everyone will know our current and future plans for Drop Target. As of right now, Jon and I have plans to make seven issues of Drop Target. For each issue, we will do a first printing of about 400 copies, which have the screen printed covers and full color center spreads, which fold out - these will cost $5.00 each. After those 400 copies are gone, we will make a second printing of each issue, with plain black and white covers and center spreads - these will only be $4.00 each. Then, once all seven issues are out, we are going to make a print-on-demand collection of all seven issues, using Lulu.com (like I have done with my Phase 7 collections) which will have a full color cover, a perfect-bound spine and black and white interiors. Because we only have seven issues planned, we are not going to offer subscriptions. We will post on this site when new issues are available, and we also send out complementary copies to key members of the pinball community, with the hope that they will help us spread the word. Hopefully everyone who is interested in the zine will have plenty of time to get a first edition copy of each zine. Okay, I hope that clears everything up. Feel free to leave a comment or shoot us an email if you have more questions! And thanks again for checking out our zine. We are already working on issue #3, which we hope will be out by the end of the summer!